In the mid-1920’s, Elmer Keith was experimenting with various cast bullet designs using experimental moulds that he had commissioned Belding and Mull to cut for him. In 1928, he refined his ideas and took these new designs to the Lyman Gun Sight Corporation for them to manufacture as a part of their Ideal Bullet Mould line (Lyman had just bought Ideal 3 years before in 1925). Thus was born the Ideal 429421 and the concept of what would later become known as the Keith semi-wadcutter (SWC). A landmark in terms of handgun bullet design had been firmly cemented in place. The .44 Special Keith SWC was quickly followed by the 452423 (for the .45 ACP and .45 Auto-Rim), the 454424 (for the .45 Colt) and the 358429 (for the .38 Special). Each of these bullets was found to be an excellent all-round bullet for target work, plinking and hunting. Keith suggested that if additional shock were desired, his designs could be easily hollow-pointed for rapid expansion and more devastating wound channels. Shortly thereafter (in the early 1930‘s), Harold Croft and Capt. 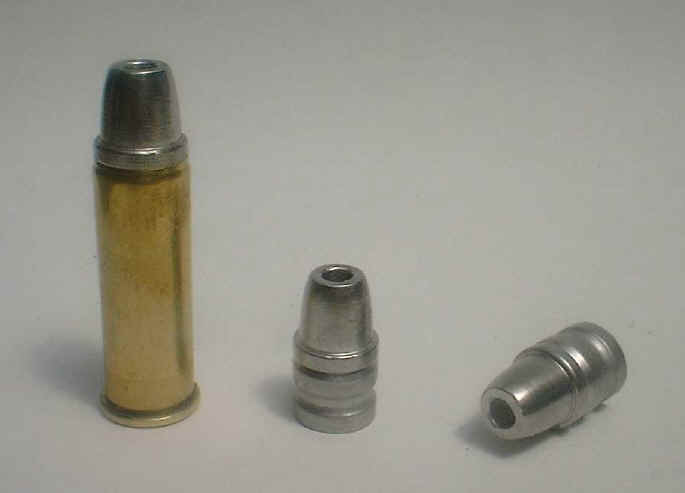 Frank Frisbie ordered the first hollow-point version of the 358429 (the HP version was given it's own number designation of 358439). This bullet design proved to be so successful, that Elmer went back and had HP versions made for all of his SWC designs. He ultimately settled on an alloy of 16 parts lead to 1 part tin for these cast HP’s (BHN = 11), and a muzzle velocity of 1200 fps for the .44 Special and the .38/44 Heavy Duty, and 1100 fps for the .45 Colt. Another landmark was established. The Keith HP’s were, and still are, exceptional performers when the moulded metal hits the meat. Now let’s fast forward to the early 1960’s -- Elmer had been lobbying the firearms industry (along with Bill Jordan) for a .40-.41 caliber duty revolver for law enforcement personnel. The industry responded with the .41 Magnum in 1964, with S&W producing the guns on their N-frame, and Remington manufacturing the ammunition. Lyman immediately jumped onto the .41 bandwagon , advertising their new “.41 Keith SWC”, the Lyman 410459. There was only one problem -- Elmer Keith didn’t design the Lyman bullet, he didn’t particularly care for the design, and he didn‘t like his name being used to sell something that he had played no part in developing. Lyman had made the 410459 more aerodynamically streamlined by elongating the nose and making the meplat smaller, and they used a radiused grease groove to insure that bullets would drop from the moulds easily. Keith didn’t like these features; he liked a large meplat to create open wound channels and a “square-cut” grease groove to hold more bullet lube. While he grudgingly admitted that the 410459 was an accurate bullet design, it was just not right (in his eyes), and it certainly was not a Keith. He turned to Hensley & Gibbs to capture the concept of the .41 Keith SWC in metal -- 3 equal width driving bands, a broad meplat, a radiused ogive, beveled crimp groove, and a square-cut lube groove. The result was the 220 grain H&G # 258. Saeco soon followed suit with a similar design. In Keith’s eyes, the .41 Magnum was now properly endowed. Handgun hunting has come a long, long ways since the .41 Magnum made its debut in 1964. Various “fashion trends” have come and gone over the years, whether light bullets driven ultra-fast or hard-cast heavyweights at more moderate velocities, the aim always seems to be taking some parameter to extremes, whether muzzle velocity or bullet weight. Each of these approaches has value to the handgun hunter, but neither is a “Universal Truth”. The concept of matching the bullet to the game is just as important today as it has always been (read that sentence again). Just because the SSK .44 320 grain FP has proven itself capable of cleanly killing elephant and Cape Buffalo, doesn’t mean that it’s an optimum choice for smaller animals like pronghorn antelope; it’s designed for maximum penetration through thick skin and heavy bone and leaves a deep, narrow wound channel. In a 125 lb. antelope, a hard-cast heavyweight just doesn’t do that much damage before it runs out of antelope to do damage on and simply exits the far side. The hard-cast heavyweights are better suited to larger animals (elk and up) where 4+ feet of penetration are needed to go through the vital organs, inducing hemorrhage throughout the entire length of the wound channel. For deer/antelope sized game, the hunter only needs 14-15 inches of penetration to make it through the vitals, and so to maximize hemorrhage it is to the hunter’s advantage to use an expanding bullet to make this short wound channel as wide as possible. Yes, complete penetration is a good thing, and an exit wound is always desirable, but it doesn’t take a 300+ grain hard-cast solid to punch through a deer! All that excess bullet weight comes at the cost of velocity, which is precisely what drives expansion, and expansion is what makes wound channels wider. After many decades of development, today’s commercially available JHP’s provide the handgun hunter with useful controlled expansion at typical magnum revolver velocities. For the record, the Keith HP’s were providing this level of performance before there were any Magnum revolvers, and long before the intricacies of joining dissimilar metals into a JHP that would expand reliably without flying apart were understood. When the .357 and .44 Magnum revolvers made their appearance, the Keith HP’s found another natural home, the 358439 as a varmint bullet and the 429421 HP for medium game. The .41 Magnum would be equally well-served by such a cast HP. The only problem is, I had looked for a HP mould that would be suitable for the .41 Magnum and never even found mention of one. So I resolved to make one. First, a single-cavity Lyman 410459 was located and obtained. A little lathe work converted this mould to cast HP bullets (this conversion will be covered in greater detail in a forthcoming book). The HP cavity was made roughly the same size as those found on the 358439 and 429421 HP so the expansion properties of this new HP would be midway between these two bullets, since the wall thickness surrounding the HP cavity would be intermediate between the two. The 358439 is an explosive varmint bullet and the 429421 HP delivers more controlled expansion (of course, both of these properties are dependant on the alloy the bullet is cast with, and the velocity that the bullet is delivered with). Thus the 410459 HP was anticipated to provide rapid, but not explosive expansion at magnum revolver velocities. In other words, excellent performance for deer and antelope sized game. The bullets drop from this mould at 208 grains when cast with WW alloy + 2% tin (BHN = 11 on my LBT hardness tester). Tin is very important to cast HP’s as it helps to attenuate the brittleness induced by the phase segregation of the roughly 3% antimony carried in the alloy. Loaded on top of 21.0 grains of W296 and sparked with a CCI 350 primer they deliver 1320 fps from a 6 ½” S&W 657 Classic Hunter. This is a very flat-shooting and accurate load. I had drawn a doe tag in our unit on the Snake River in eastern Washington, and figured this would provide an excellent opportunity to evaluate the 410459 HP in the hunting fields. Opening Day leaked into the eastern horizon gray, colorless and crisp. Slowly the orange hues of sunrise crept into the sky with the stealth of a bullsnake stalking a terrified mouse. In the pre-dawn darkness I worked my way into one of my favorite basalt encrusted canyons, to an outcrop that I have come to know well over the years. As the pre-dawn light levels rose, I spotted 3 bucks feeding across from me, about a quarter of a mile down canyon. A couple hundred yards above them were a father/son team, and from his hand gestures and whispered insights I could tell the father was giving his 12 year-old son his introduction to the art of deer hunting. We have a three-point minimum here in Washington, and as near as I could tell in the gray haze of pre-dawn one of these bucks was legal, but the other two were forkhorns. To tell the truth, I was having as much fun watching the father teach his son as I was having watching the bucks. About 20 minutes later, a single well-placed shot from the boy’s rifle folded the distant 3-point in his tracks. Patience, persistence and precise shot placement, what an outstanding recipe for a young man’s first buck! Opening Day was off to an excellent start! As they field dressed the buck and started to pack out the front quarters, an average sized mulie doe (about 160 lbs.) and her yearling worked around the nose of the canyon and slipped in quietly below me. I quietly thumbed the hammer back on the S&W 657 Classic Hunter .41 Magnum, and tracked the doe with the black on black sights as she trotted from my right to left. About 50 yards in front of me she sensed danger and skidded to a halt in order to evaluate her new surroundings. The front sight blade settled in behind her shoulder and the .41 Magnum spoke. She launched herself downhill in that lunge so typical of a heart-shot animal, then turned to her left and circled tightly back around to the spot where I shot her and collapsed. She covered no more than 20 yards in her last dash. The 410459 HP entered just behind her left shoulder, about halfway up. It angled forward and down, exiting low in the point of the right shoulder. Expansion was positive. The 410459 HP had shredded the forward third of both lungs and punched through the heart. The bloodshot tissue in the lungs was approximately 6” in diameter. The exit hole inside the off-side ribcage was the size of a quarter. The exit wound in the right shoulder was roughly a .50 caliber hole. In short, the bullet had performed precisely as hoped, expanding smoothly and punching all the way through. Now it was my turn to field dress and pack my animal out of those rocky Snake River canyons. As I was loading the hindquarters into my pack-frame I had a nice chat with the father across the canyon as he packed up his son's second load. He was rightfully proud of his son’s performance on his first buck, and I extended my congratulations, as well as my commendation on his teaching skills. It was a fine morning indeed! The 410459 SWC isn’t truly a Keith, and there are several things about it that Elmer just flat didn’t like. But Elmer very much liked cast HP’s for hunting deer-sized game, and the 410459 HP lives up to his vision quite nicely. At 208 grains it carries adequate weight to punch through deer-sized critters. The long skinny nose makes for an aerodynamic, flat-shooting bullet, and what the 410459 HP lacks in terms of meplat, it makes up for in terms of expansion. I wonder what Elmer would say about the 410459 HP?